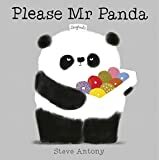 Steve Antony’s latest picture book is a simple, funny lesson in manners. The main character is a rather lugubrious looking panda who has a tray of tasty doughnuts. Mr Panda offers one to various creatures in turn, but before any of them actually gets a doughnut (only the ostrich declines, and very rudely, too) the offer is withdrawn. Finally a well brought-up lemur says please and is rewarded with the whole tray. There’s much to discuss here, as Mr Panda himself could certainly be politer! The colourful doughnuts look particularly delicious as everything else, apart from the odd beak or eye, is black, white or grey. The book has a Jon Klassen appeal to it, with its repeated text, restricted colour palette, minimalist backgrounds, and the way that sometimes only tiny changes to the artwork – a raised eyeball on the whale for instance – are used to convey different emotions.